In the years following the end of the Great War the civilian population that had once lived in the towns and villages on the former battlegrounds began to return. 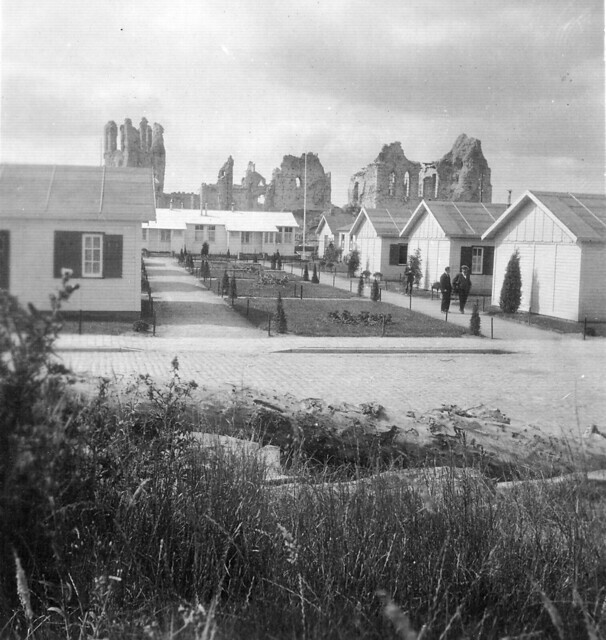 In the immediate area around Ypres the villages were uninhabitable for the first couple of years, so people lived in Ypres at night and went to work on their former homes during the day; clearing detritus and rubble in preparation for a rebuild. This image shows one of the temporary communities for such people. 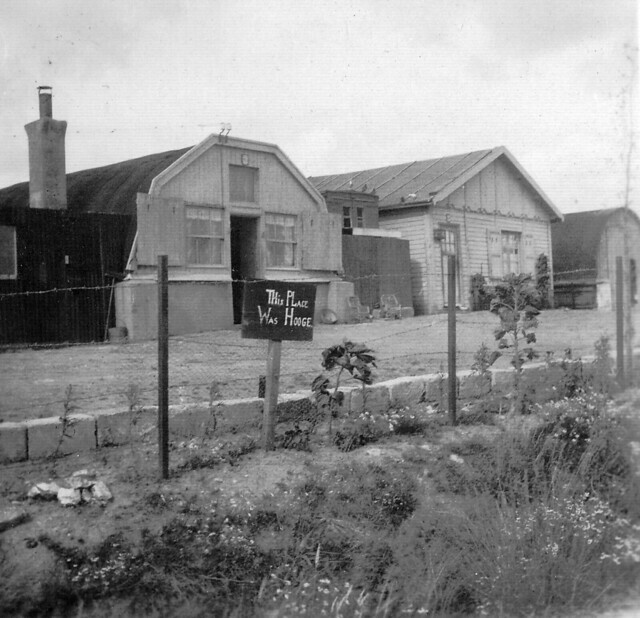 The provisional wooden housing was put in place until permanent residences could be rebuilt, in most cases at least 3-4 years after the war was over. In the background are the ruins of the Cloth Hall and St Martin’s Cathedral and their state would indicate this image dated from around 1920-21. During the Third Battle of Ypres tanks from the recently formed Tank Corps operated in Flanders, but usually with limited success. The nature of the ground meant that many bogged down and were either damaged or destroyed by artillery fire. Many infantry soldiers referred to them as ‘shell magnets’ on the open battlefields leading up to Passchendaele. These tank wrecks were still very visible in the 1920s and many became tourist attractions, most notably close to the Menin Road at the so-called ‘Tank Cemetery’. 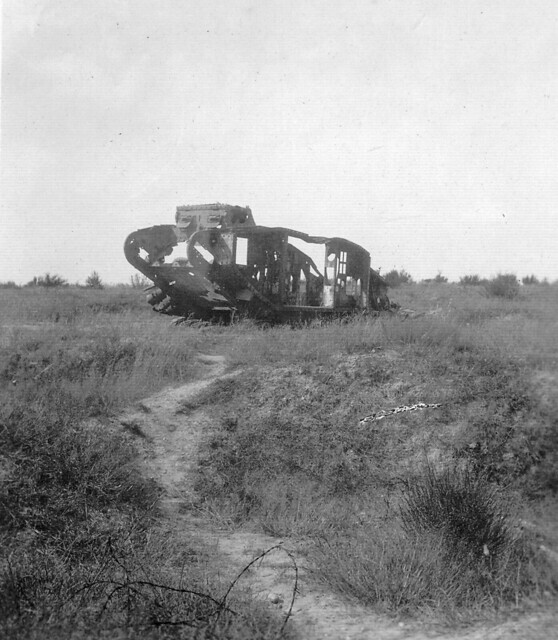 This particular Mark IV tank was lost ‘near Langemarck‘ according to the caption and appears to be a partner of another Langemarck Tank previously featured on the website. There are no distinguishing marks on this vehicle so it is impossible to speculate when and how it was lost. However, research indicates it may be a tank from B Battalion Tank Corps, who were action here in August 1917. 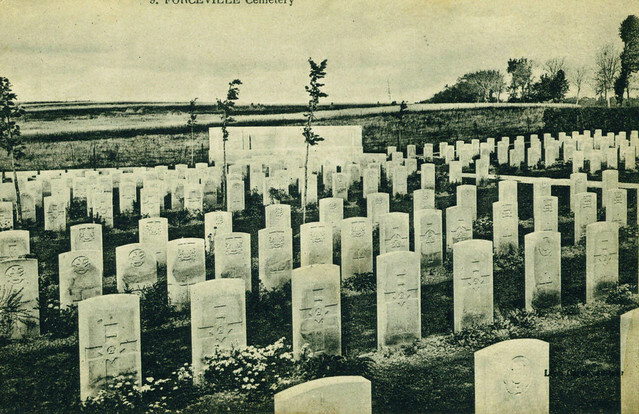 This unusual image from the early 1920s shows a British party from one of the Graves Registration units involved in clearing the dead from the Great War battlefields. Few photos of this work survive, and the caption for this says it is at ‘Nieuport’ but that seems unlikely given the nature of the ground and the fact that British soldiers were only there a short period. 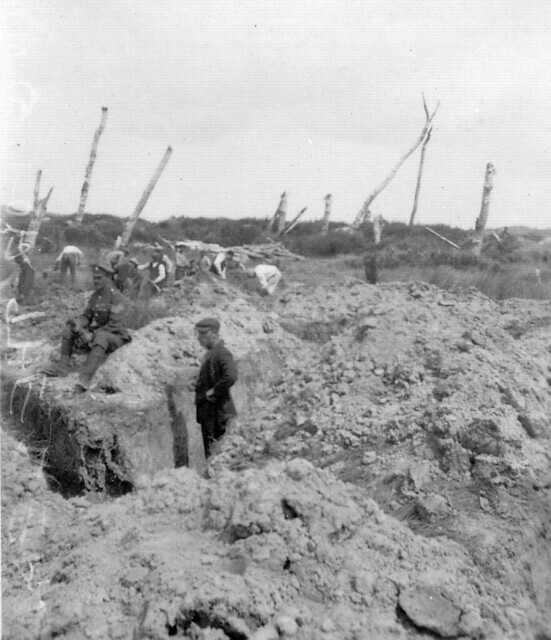 A Sergeant sits on the edge of a trench while people work in the background and another civilian helping stands in the remains of a Great War defence work. There are no evidence of any bodies but it does demonstrate to some degree the sort of work that went on under the watchful eyes of an NCO in charge of such a unit. The work continued for some years after the war and many thousands of soldiers were found and reburied, albeit it often as unknown soldiers. What the work must have been like for those carrying it out we can only imagine. 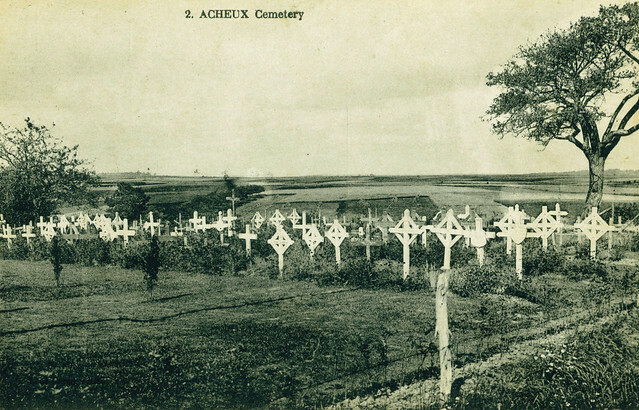 We return to the Aftermath of the Great War this week with a photograph from the stereocards which contain images taken on the battlefields in 1920. Peronne was a town which had been a German headquarters until it was abandoned in 1917. It was then used by the British until lost in the German Offensive of March 1918 and then finally liberated by Australian troops in September 1918. Although not raised to the ground like Ypres, none of its buildings escaped damage and it classified as part of the Zone Rouge post-war. The Chateau in Peronne was actually an old French infantry barracks, which had seen brief fighting between Wellington’s Redcoats and French troops in the aftermath of Waterloo in 1815. 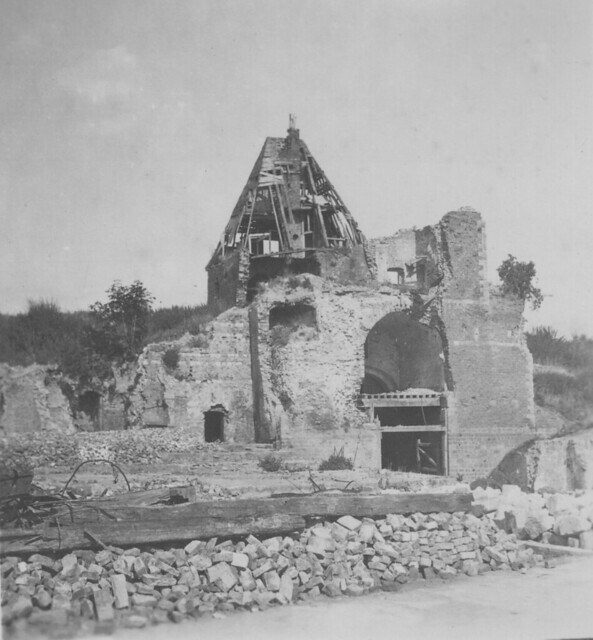 The Germans had used it as an Army Headquarters as its walls were so thick; by the end of the war although badly damaged it was the only building which survived partially intact and it remains in the centre of Peronne to this day. For many years the Chateau was abandoned but in 1992 it re-opened as the local war museum, the Historial and it remains in use for that purpose to this day. Parts of the structure seen in this image are still visible in the Historial today.